← Far East Movement On Tour w/ Mike Posner – Tour Dates Here! Lil Wayne is gone till November but any news we hear or see about the Young Money CEO we want to know about. 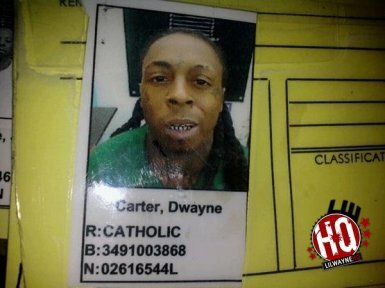 Lil Wayne’s Rikers Island prison I.D. photo showed up on the internet. In the pic we see Wayne without his classic diamond encrusted fronts, it’s a weird to see Wayne without them. We see that Weezy hasn’t cut his dreads, his infamous locks are still long, long hair don’t care.